As 2018 comes to a close, it’s the best time to reflect on the past year. And what better way to start saying ‘YES!’ to the things we have yet to achieve! 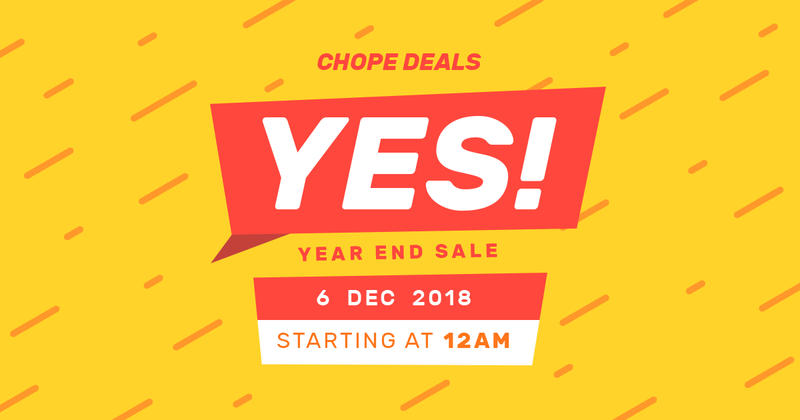 Mark your calendars for the 6th of December because it’s time to go all-in with Chope Deals’ Year End Sale (YES!) that’ll bring you some of the best eats around town at the best prices. From 50% off 50 top places in Singapore to unbeatable set menu combo deals, you’re sure to find something to say ‘YES!’ to. Plus, don’t miss the $10 flash deals happening at 12pm, 3pm, and 6pm on that day itself, so have your alarms ready! While you wait for the actual sale, you can also try your luck and stand a chance to win discount codes worth up to $50 with the Spin & Win from now until 5th December 2018. Brave the crowd and beef up your meals at Waa Cow! Lunchtime in the Central Business District may be daunting, which is why getting a table on Chope makes it a lot easier especially at places like Waa Cow! Dishing out the first flame-torched beef bowls and premium Wagyu sushi in Singapore, it’s easy to see why diners are willing to queue for a spot this tiny eatery. Score 50% off the 4-course Set Menu at Waa Cow! with YES! on Chope Deals. Always playing it safe? It’s time to embrace the spice of life at Chengdu Restaurant. We get that not everyone can handle the heat when it comes to spicy food but if there’s a time and place to start, we’re placing our bets on Chengdu Restaurant, and the time is now! Be transported to Sichuan when you step into this intimate space and get your taste buds ready for a roller coaster ride. Daredevils will love the Spicy Mala Pot, a delicious dish of chilli, frog meat, and a combination of secret sauces. The dish has the perfect combination of spicy and salty flavours that pair perfectly with white rice. For the perfect small plates to go with your pint of beer, we recommend the Spicy Wantons (老麻抄手) or Dan Dan Noodles (担担面). Score 64% off the 2-course Set Menu at Chengdu Restaurant with YES! on Chope Deals. So you’ve been saving up the whole year – it’s time to give yourself a good pampering at Art. After #adulting and saving up for a whole year, it calls for a good celebration. Why not splurge and treat yourself before the year ends at Art? You deserve it. This elegant 80-seater Italian restaurant and bar maintains its European roots but brings to the table contemporary dishes that marries Eastern and Western influences. Start your experience with Red Prawns, Foie Gras, Blood Orange, and Seaweed to tease your taste buds. Follow up with the Seabass, Eggplant Cannolo, Pine Nuts, and Leeks or, if you’re feeling fancy, a Pork Tomahawk, Candied Endive, Rosemary and Vincotto for two. For all you sweet-toothed foodies, we hear that their Nashi Pear, Yuzu Granita and Pomegranate is well worth the calories. Score 30% off at Art with YES! on Chope Deals. Italian cuisine doesn’t have to be expensive! Experience true-blue Italiano favourites at La Nonna. Higher price tags do not equate to better flavours and La Nonna is a testament to that fact. Whipping up dishes that would make any nonna (Italian for grandmother) proud, this cosy restaurant should be on everyone’s list for great Italian favourites that don’t break the bank. Dive right into comfort with Penne with Chicken in Pesto ‘Genovese’ or Linguine with Crab in Tomato Cream. If pizza is more up your alley, be sure to get the La Nonna Pizza, a flavourful pizza topped with tangy tomatoes, stringy mozzarella and Parmesan, crunchy asparagus, heartwarming eggs and black truffle. Whichever your cravings desire, rest assured that you’re in great hands. Score 55% off the 2-course Set Menu at La Nonna with YES! on Chope Deals. Add a little sin into your healthy bowls and mix things up at Urban Mix. It’s no secret that healthy bowls saw their fair share of active followers in 2018. At Urban Mix, take your healthy bowls to a whole new level with international flavours that are sure to satisfy. A quick glance at the menu is enough to get your appetite going. Take your pick from the preset specials such as Korean Gangnam Style, LA Crossfit, and more. Not sure which to get? Start with Viva Mexico, and tuck into grilled chicken thighs, mushrooms, guacamole, and corn with a healthy helping of quinoa. Those who prefer the freedom to create their own bowls will delight in the varieties of bases, proteins, toppings, and sauces available. Go crazy! Score 50% off the Signature Bowl Set at Urban Mix by Vatos with YES! on Chope Deals. Love traditional Chinese? Challenge yourself before the year ends at Mitzo Restaurant & Bar! Heritage Chinese cuisine doesn’t stray far from the mainstays such as Sweet & Sour Pork and Peking Duck, but let Mitzo change the way you perceive (and enjoy) Chinese classics. Located at Grand Park Orchard, the contemporary trappings at this Cantonese establishment is probably a dead giveaway that they do things differently here. Their most raved-about dish is the Black Truffle Crispy Roast Duck; think juicy duck meat, crispy skin, and gentle notes of truffle – what’s not to love? If you really want to get your mind blown, go straight for their dim sum offerings. Trust us, the experience is going to be unforgettable! Score up to 50% off at Mitzo Restaurant & Bar with YES! on Chope Deals. Scared of heights? It’s high time to overcome that at Salt grill & Sky bar! Sometimes, all it takes is a good view and an amazing meal to help you brave your fears. In this case, leave your worries by the door at Salt grill & Sky bar and indulge in great Australian dishes over Singapore’s breathtaking skyline. It goes without saying that amazing grills and barbecues are the star attraction here. From Riverina Sirloin to a Westholme Wagyu Flat Iron, the dishes at Salt grill & Sky bar are guaranteed to be top-notch. Fresh seafood and seasonal produce are the highlights at this classy establishment, and it shows. For a taste of Chef Luke’s true culinary ingenuity, order the 6-course tasting menu for the ultimate experience. Score up to 50% off at Salt grill & Sky bar with YES! on Chope Deals. If fusion isn’t your cup of tea, Spagtacular might just change your mind. Give fusion eats a try at Spagtacular with their selection of simple, locally-inspired Italian eats. Taking the art of the in-between to bring a new breath to the food scene of South Bridge Road, this neighbourhood eatery serves up the likes of Chili Crab Pasta or Curry and Assam Pasta and other familiar flavours that we all enjoy. Looking for a spot to enjoy small bites with friends? Go for their tantalising nibbles like the Mini Har Cheong Gai and Truffle Fries. Score 54% off the 3-course Set Menu at Spagtacular with YES! on Chope Deals.